John Jones is from Adrian, Michigan and was born in 1961. John D. Jones. Michigan decoy carver and artist started carving decoys in 2005 after watching a local outdoor magazine TV show which featured a renowned decoy carver from Michigan Tom Christensen. 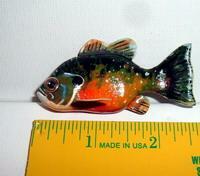 Even though John is an avid hunter and fisherman, he had never heard much about fish decoys. Being from the extreme southern lower peninsula, John never experienced spearing through the ice. Mostly just hook and line fishing and tip ups. He was fascinated, so after a little research on the web John found out that fish decoys were quite popular, and had a lot of history. John decided to try and make a few, and to my delight, He actually sold them and that rapidly made him to dive right in to making these practical and beautiful folk art treasures. John became passionate about making decoys. 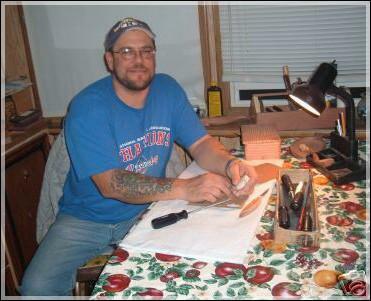 It combines his love of art with his love of woodwork. It doesn’t require a lot of big power tools. Something John can do sitting on the porch. He have been a carpenter his entire adult life, but was always a practicing artist, doing drawings, paintings, and woodwork. So fish decoys fit right in to everything he likes to do. 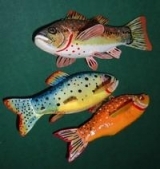 He has learned a lot chatting online with other carvers, and am in a fish decoy carvers group on the web which includes a lot of world class carvers. John has found that carvers are very helpful and encouraging. He continue striving to improve. To date (May 2006) John have made and sold over 75 decoys. John is a member of the National Fish Decoy Association, and he hopes to join a couple other organizations this year. John has not entered any competitions, but again he hopes to this year. His decoys are all hand carved and hand brush painted. John describes his decoys as semi-realistic folk art. He does a variety of styles. Most of them are in the 7-8″ range, but he has made them anywhere from under 2″ to over 14″. John said “I really like doing smaller ones in the4 to5″ range.” John believes he will continue to improve, and hope to make fish decoys for many years. John will try to carry on the carving traditions by teaching his two sons. John’s favorite carvers are: Tom Christenson of course, Rich Brooks, Tim Spreck, Aage Bjering, Sonny Molina, and Dale Claus just to name a very few. Update 5/2017 – Born 1961 and raised in extreme southern Michigan in a large farm family. Now residing in Dearborn, MI. Self taught artist by observing my Mother who had a master of arts degree. She was a canvas painter (abstract mostly) and she taught me a lot about color and visualization. I actually learned a lot of brush techniques by watching Bob Ross on PBS. I have been a carpenter and building maintenance man for over 30 years. Being raised on a farm in the country I was always an avid hunter and fisherman. As a kid and into my adulthood I made extra money by drawing. Cartoons, logo’s, tattoo art etc. 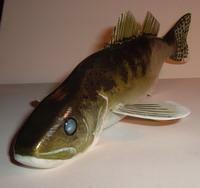 In 2006 I seen a PBS program about Michigan decoy carver Tom Christenson and there my obsession with fish decoys started. Early on my decoys were not much more than pretty sinkers, but after entering a few competitions I learned how to make them truly functional. I have gotten a lot of generous advice from master carvers, and my mentor Maurice Stiff. I describe my style as realistic folk art. Normally all my decoys have a natural shape and form but with “folksy” paint schemes. I use simple tools, a knife and files, and brush painted exclusively. Fish decoys combined my love of hunting and fishing, folk art, and woodworking together. It has become my passion. In 2016 along with a few ribbons I was awarded a trophy for best of show folk art decoy at the world championships of the Great lakes fish decoy assn. I continue to learn all the time. I am amazed at some of the phenomenal artists I have seen and met, and it is still a great inspiration. I have so many favorite carvers but most of my favorites are on the folk art side of the craft. My hope is that I can promote the art of the decoy and someday teach youngsters the craft. Permission to print provided by John Jones.